For years I have been dreaming of going to Paris. 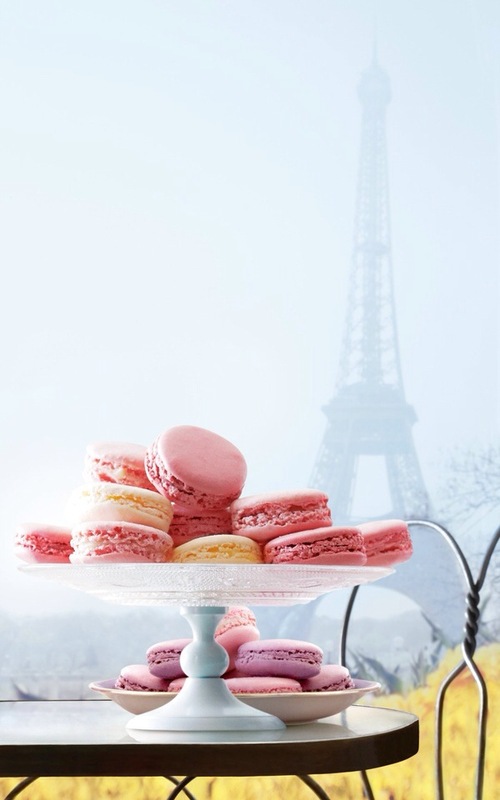 Ever since I started Aurora Belle and mastered my first French macaron, I knew I had to visit France. So needless to say that once I booked a trip to London I had to fit in a trip to Paris (there was no way I was going to be so close and not go there). All of my friends and family expressed major concerns for my travel to Paris, being the fact that the terrorist attacks had just occurred in the city less than a week prior. But I knew that nothing was going to stand in my way. So without any hesitation I made my dream come true last November. My trip was everything I dreamed of and more…I was asked out on a date by a Frenchman, enjoyed the French architecture, learned how to make French croissants, stayed with a French family, ate my way through the city, and finally got to savor a French macaron in Paris! I’ve always heard the term ‘love at first sight’ but never actually experienced the feeling until I got to Paris. It was instantaneous; as soon as I stepped foot off the train at Gare du Nord I knew that it was where I was meant to be. I had taken one of the first trains out from London in the morning (I couldn’t sleep the night before because I was so anxious). It did not matter that I was functioning on 3 hours of sleep, I was going to make the most of my two days in the ‘City of Lights’. I had so many things I wanted to do and see: the sights, the spirits and the food. As I exited the train station in the rain, I jumped on a sightseeing tour bus and I was off on my Parisian adventure. I got to see all of the main attractions: the Eiffel Tower, Musee d’Orsay, The Louvre, Cathedral Notre Dame, Champs Elysees, the Arc de Triomphe and Sacre Coeur. But the most important thing on my list was to indulge in all of the French food delicacies. Surprisingly I found it quite difficult to find time to eat during my sightseeing travels. However, I did make sure that I stopped by Pierre Herme to try his macarons since he has been my inspiration and the reason why I’m in business today. I now can attest that my French macarons do indeed taste like the ones I’ve eaten in Paris…which makes me quite proud! My second day in the city was all about the food; I booked a pastry class and walking food tour (it was quite the busy day but definetly worth it). The food in Paris is absolutely amazing and nothing like I’ve ever experienced in the states. The food tour took us through the Marais neighborhood to a boulangerie, chocolatier, fromagerie, charcuterie, spice shop and wine shop. Everything was so fresh and tasted so rich. I still dream about the creamy butter, delicious cheeses, melt in your mouth caramels, robust chocolates and let’s not forget about the wine. I tried pate for the first time (it wasn’t my favorite but I was open to it). I must say that the highlight of my trip was the French pastry class that I took in Montmarte. I learned how to make the classic butter croissant as well as pain au chocolate which were heavenly…they literally melted in my mouth! I ended up hitting it off with the chef/owner of the school and have remained in contact with her since I’ve returned home. I literally could not stop smiling the entire time I was in Paris (except when I got lost and walked aimlessly in the rain at night). But even when I was lost I felt alright, because I found the people to be so friendly and helpful. Although I was only in Paris for two short days I tried to make the most of my time while I was there. I really think it was the happiest I have been in a very long time and I’m ready to go back. I cannot wait for my return, there are so many more things I want to do and eat. Paris spoke to my soul and I intentionally left my heart there so that I can one day return to retrieve it with the love of my life…dreams do come true! Finally Getting the REAL Taste of Paris: A Dream Come True! For years I have been dreaming of the day that I would be able to visit Paris, France. I always imagined myself roaming the Parisian streets wearing a chic beret, snapping photos in front of the iconic Eiffel Tower and most importantly stuffing my face with tons French pastries. I can hardly contain my excitement because before I know it, I will be doing these exact things…my time to visit the City of Lights has finally arrived! It was a spur of the moment decision, in the fact that I did not have this trip planned for months and months (like I normally have done with previous international trips). I literally woke up one day about a month ago and thought to myself, “I work too hard not to enjoy my life…just do it!” On New Year’s Day, my friends and I created vision boards to help motivate us for 2015. I had placed pictures of Paris/Eiffel Tower on my board and would look at it every morning when I woke up and every night before going to sleep. There is something to be said about the power of suggestion. Since I will only be in Paris for two days, I know that I have to make the most out of this trip. Of course I intend on seeing all of the main attractions but there’s something more important that is driving my visit…that’s right, it’s the food! This trip is becoming more for my business rather than for me personally. I want to experience authentic French baking and taste all of the delicacies and specialties that Paris has to offer. I want to walk into all the Parisian patisseries and boulangeries to soak in every little detail, I want to remember it all: the smell, the tables, the floor, the people, the sounds, everything. It’s my own little quest for research to bring home and incorporate into my vision. Right after I booked my travel arrangements, I was watching a cooking show on television and Gordon Ramsay made a comment about Paris that struck a chord in me. He said that his passion for cooking was ignited when he went to Paris and in that exact moment it hit me like a lighting bolt. I picked up my iPad and began searching for pastry classes that were available to take during my visit. I found one and booked it, so it is official…I will be learning to make croissants in Paris! I chose the croissant to master in France because in my opinion it is probably the most technical and requires a lot of steps. From all of my research and reading, they say that a croissant from France is like no other…so I might as well learn from the best. Naturally I am super excited about this upcoming trip. Although it will be short, something tells me that this won’t be my last time visiting Paris. I do plan on making the very most out of my two days in the city. I cannot wait to document my journey and share with everyone. Please stay tuned because the best is definitely around the corner…Paris here I come! I’m super excited & proud to say that this August I will be showcased as a vendor at the upcoming Fall Bridal Fantasy Show at the Sawgrass Marriott in Ponte Vedra, Florida. I had attended the Spring bridal show with a friend and I was very impressed by the entire event (staff, crowd, vendors, space, venue…it was so professional). While we were walking around I even remember telling my friend that I was going to make sure that my business was a part of the next show. Well, I made it happen and on August 30, 2015 Aurora Belle will be set up to provide all of the jovial brides of Jacksonville a little taste of Paris! I’m looking forward to meeting potential brides and having them sample my macarons so that they can experience the authentic taste & texture of a true French macaron. I know that macarons are not well known to the masses and hopefully I will be able to introduce the bridal show attendees to a tasty new world. I’m especially excited to unveil my latest venture in the culinary realm, that I know will be a fantastic & quite delicious surprise. It might just be a show stopper! I definitely know that it will be something fresh and innovative for the brides…but I’m going to save this until it’s showtime (but believe me, it will be absolutely magnificent). So if you happen to be in the area on 8/30/15 or know someone that is planning a wedding, please come out to the Sawgrass Marriot for the Fall Bridal Fantasy Show. I promise, you will not be disappointed…plus I’ll be there bringing a little bit of Paris to Jacksonville. Come stop by and say hi! I may not be Irish, but I feel like luck has been on my side lately. I count my blessings each and every day; I’ve got a lot to be thankful for. St. Patty’s Day is around the corner and I wanted to create a flavor that related to the holiday. Since St. Patrick is the patron saint of Ireland, it makes perfect sense to dedicate this month to the green isle and make an IRISH CREAM MACARON. When I went to the liquor store to purchase the Irish cream for the filling, the clerk mentioned how people like to put it in their coffee. And for a moment I contemplated making a Irish cream/coffee mash up, but I didn’t want the coffee flavor to overpower and take away from the smooth and subtle flavor of the Irish Whiskey. The result is a silky, sweet buttercream filling that has a bite of the rich Irish Whiskey. 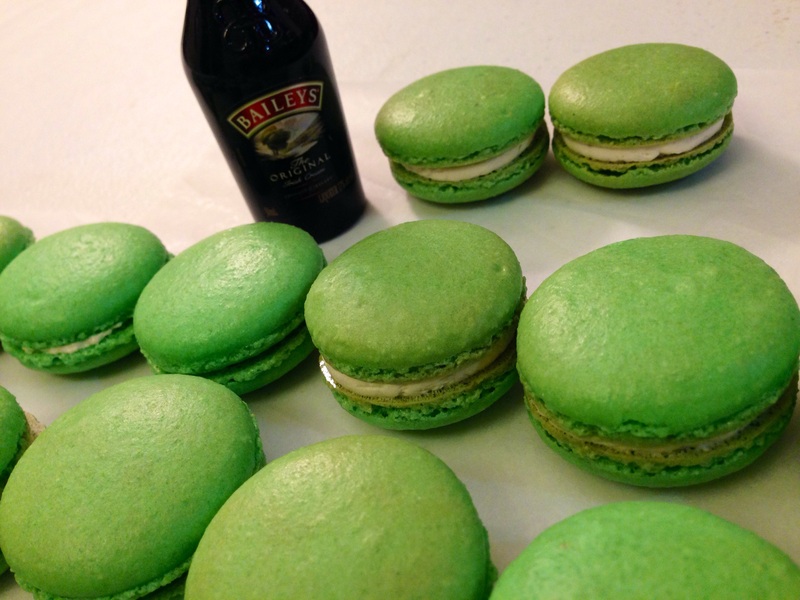 I’ve never been into the whole St. Patty’s Day traditions like the green beer or corned beef and cabbage, but I do think that my own little tradition will now be my Irish Cream Macarons. Hopefully my luck continues throughout the year and I hope the luck of the Irish finds you as well…Happy St. Patrick’s Day (remember to wear your green)! Flavor of the Month: FEBRUARY- Will You Accept This Rose? I have been wanting to try my hand at creating a rose flavored macaron for quite some time now…so what better month than February to give it a go. This is supposed to be the month of love; the month when that chubby little cherub is to shoot his arrow and make sparks ignite (I wouldn’t know because I’ve been dodging that little fat guy for a while now or maybe it’s the other way around). Whatever the case may be, this is the month of Valentine’s Day and I figured I’ll finally get my rose fix by creating a VANILLA-ROSE MACARON. I know that rose is used to flavor a lot of different French desserts. 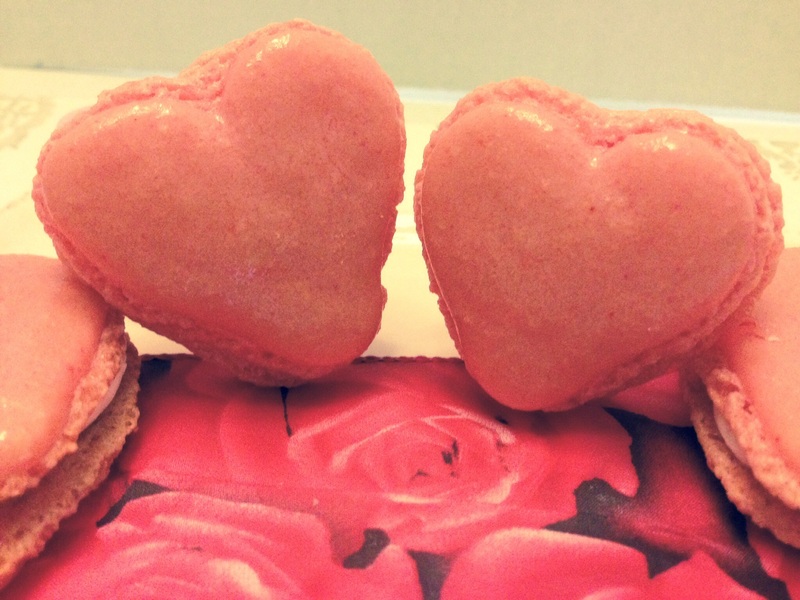 In fact, rose macarons are a regular flavor in many macaron shops. But here in the U.S. it’s not as popular with the masses; it’s more typically used as a scent for soaps and candles. I definitely did not want my filling to taste overly floral, so I decided to make a white chocolate, rose water infused ganache and made sure to mix in some Tahitian vanilla beans to help mellow out the rose flavor. After filling the cookies and biting down into my Vanilla-Rose macron, I can clearly answer: “Yes, I will accept this rose”…it’s quite delicious. Recently I had the opportunity to sample some macarons that were made by other local bakers. It was enlightening because for a while I have been wondering how they might taste. I’ve had my suspicions and from just one bite they were confirmed: they don’t match up to mine. There are no shortcuts when it comes to baking and especially with the macaron. I found that when bakers are cutting corners (for the sake of time or cost) the integrity of the macarons are compromised. This makes me upset because I’m afraid that a person’s first experience of eating a macaron is coming up short and they are missing out on a truly delicious experience. 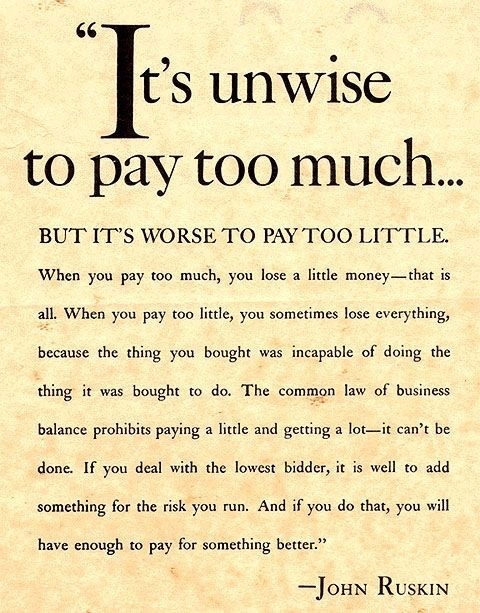 I know that we live in a society where almost everything is driven by convenience; people want fast and cheap, but there’s that saying “you get what you pay for”. Now, I value a good deal just like the next person but I will always choose quality over cost. This is why I try my hardest to provide a quality product, starting with the ingredients I use in every macaron. I use nothing but almonds, sugar and eggs…absolutely no chemicals (like cream of tartar). The almonds I use are non-GMO, Kosher and certified gluten-free. All of my fillings are made from scratch and I use imported spices that I hand grate. I use fresh fruit and make homemade jelly for fillings. My chocolate ganache fillings are made from premium chocolates that are fair trade. But there is one more very important ingredient that I have left out. Last night I was reading Dominque Ansel’s cookbook and he summed it up perfectly, he said “time is an ingredient”. Baking macarons is a process that includes patience and technique. I have spent countless hours in the kitchen perfecting my recipes through trial and error over the years. And no matter how many hundreds of dozens I have made, I still measure out every ingredient for every batch of macarons. I monitor my temperatures and utilize a more complex and technical method. Not to mention the time it takes to pipe, bake, fill and then assemble each individual macaron. It truly is a labor of love…and I love it! In the past year I have had many people contact me for my prices. Sometimes after I have sent my prices I never hear back from them. One time I had a woman tell me over the phone that she received a cheaper quote from a different baker. From this, I can ascertain that my prices are a bit more expensive than others. On the flipside, I had a different woman call me back months later (after she went with a baker that charged less) because she said my macarons were the most delicious she has tasted. Then I also had a customer call to inquire and asked if I kept frozen macarons because she had called several other companies in town and was told that they had frozen macarons and she wanted fresh. Naturally, I received her order because that is something I pride my business on: fresh, made to order macarons. I have had several people who have visited or lived in France tell me that my macarons taste just like the ones they had in France. Which is a huge compliment because my goal is to always provide an authentic, quality product. It is upsetting to me when I taste dry, chalky macarons filled with overly sweet and flavorless buttercreams. I wish people would understand that just because it may look like a macaron on the outside, that doesn’t mean it’s going to have that melt in your mouth experience that a macaron should have. I already know that I will probably lose customers to bakers that charge less than I do. However, I do send the warning that not all macarons are made equally and you may be missing out on a true French delight. I know that I provide a quality product made from premium ingredients, I do not cut corners and every macaron is made with love…and for this I am quite proud! The New Year is finally here! I’m so excited to start out 2015 with a fresh mind and new opportunities. Last year was an amazing whirlwind that was quite unexpected in a very good way. My business took off and I achieved my goal of acquainting many people to the delicious wonders of the french macaron. As I sit back and reflect upon the last year, I cannot stop smiling because I am seeing a dream come to life. That is why I would like to raise a glass and make a toast to every single person that has helped make Aurora Belle a success. 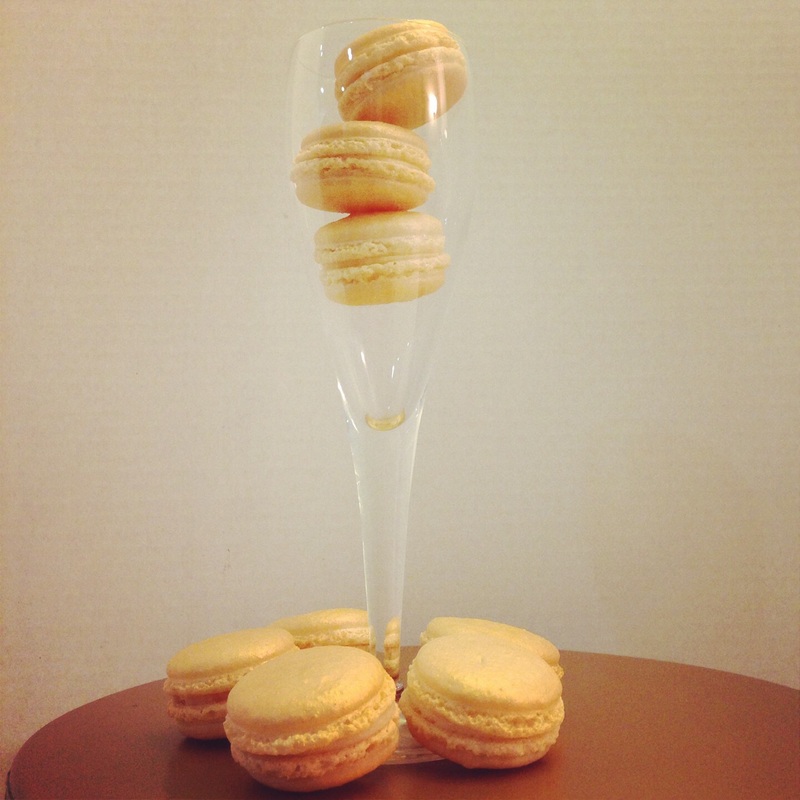 Thank you so very much and in honor of this celebration I decided to make CHAMPAGNE & STRAWBERRY MACARONS this month. Cheers to you all! It was quite easy to decide upon champagne as this month’s flavor. But I wanted to kick it up a notch and since I love strawberries with my champagne, it was a no-brainer. I made a champagne infused Swiss meringue buttercream for the filling as well as a homemade strawberry puree. Then I piped a circle of champagne buttercream and filled the center with the strawberry puree. To keep it festive, I made sure that the shells glittered & shined in gold! I have a strong feeling that 2015 is going to be an absolutely fantastic year! My goal is to continually grow both personally and professionally. I can’t wait to share the exciting moments to come and I look forward to a brighter 2015…SKUMPS!